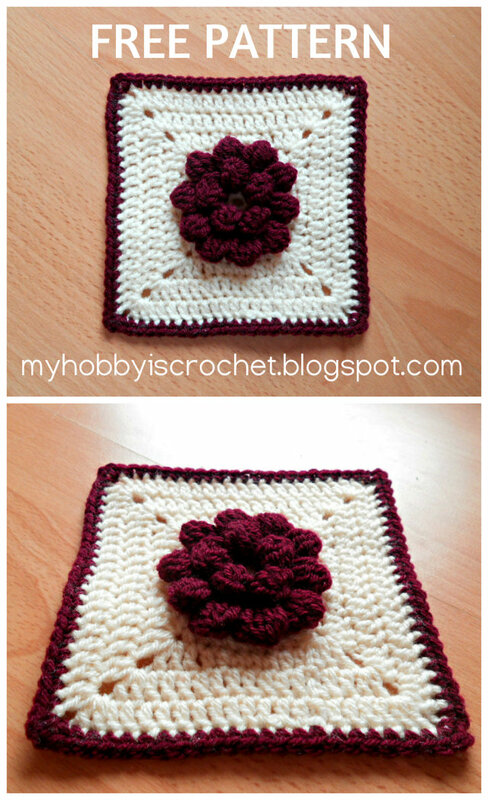 I have developed my "Dahlia Flower" pattern and transformed it into a solid granny square. 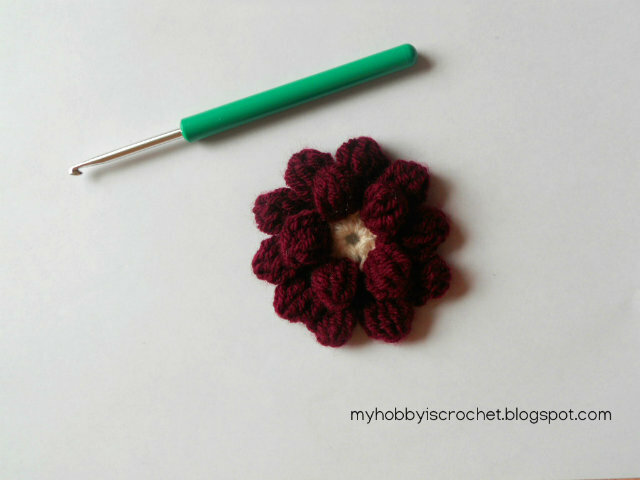 You can use this dahlia granny for many projects, such as pillows, afghans, bags, etc! 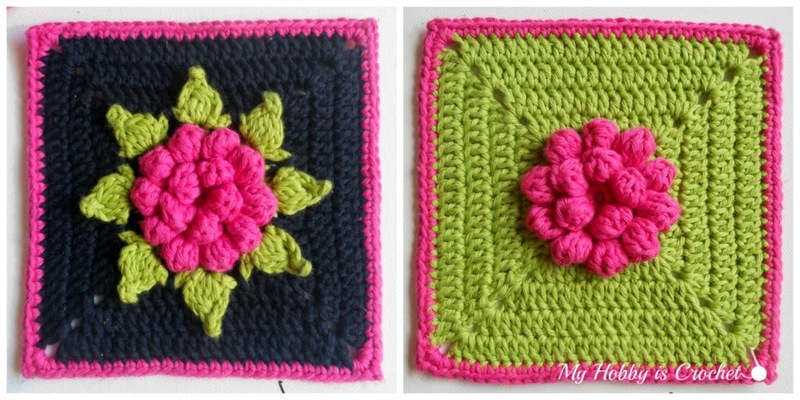 The square it is worked in continuation of the flower, using the same yarn weight and hook size as for the flower, but in a contrasting color. Note: ch3 count as a dc throughout the pattern. 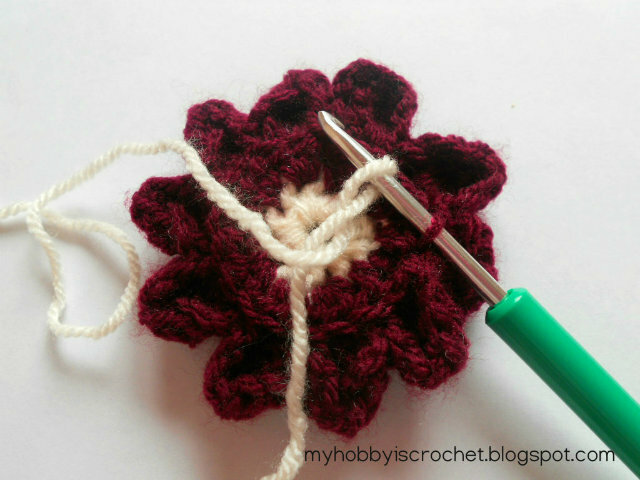 For better results replace the ch3 with chainless starting double crochet in the round! UPDATE July 23th 2014: I created an improved version without seams and published here! There is also a version with leaves, like pictured below! 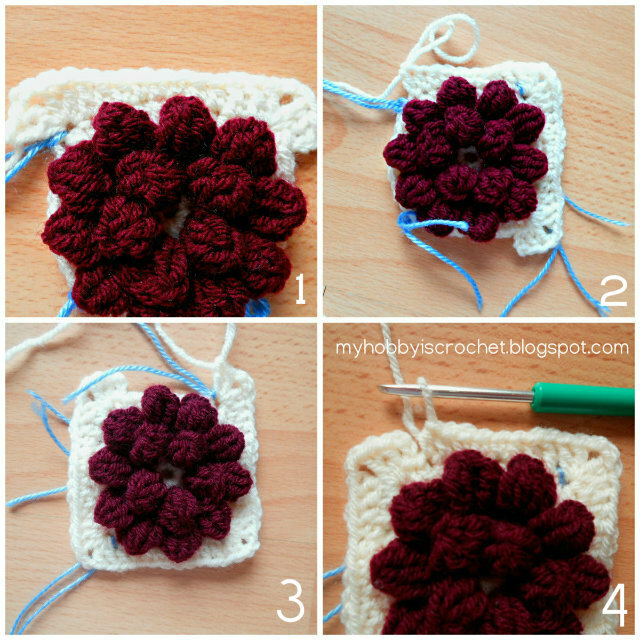 Turn your flower with the back side facing you and identify the back ridges of the last round (at the base of the petals), like in the picture below. The next round it will be worked in those back ridges. 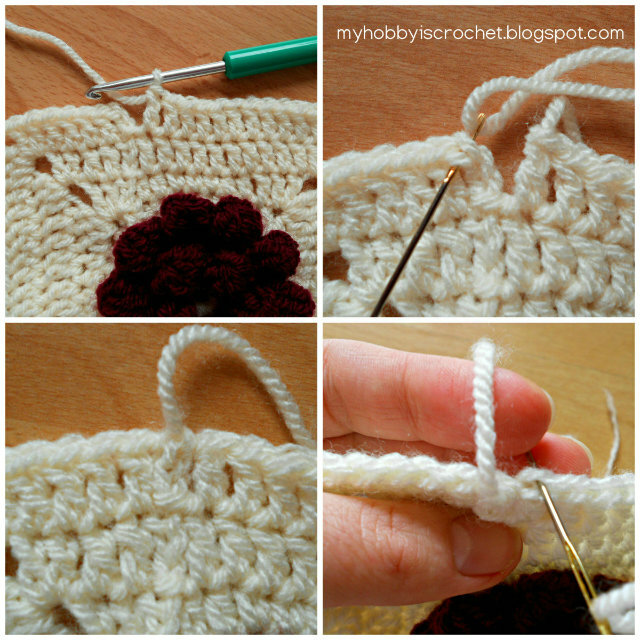 Look for the back ridges of the stitches at the base of the petals. 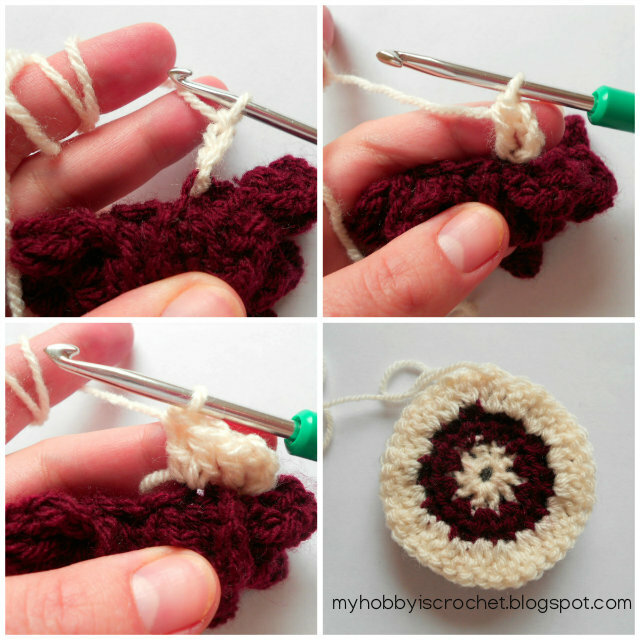 You have now a circle with 40 dc stitches that you will transform in a square. Squares have 4 equal sides; so divide 40:4=10. That means that in each 10th. stitch you will have a corner. To make your work easier, with the right side facing you, mark each 10th. dc (corner) with a piece of yarn, starting with the first dc after the beginning ch3. Back side of the first round! You will mark each 10th. 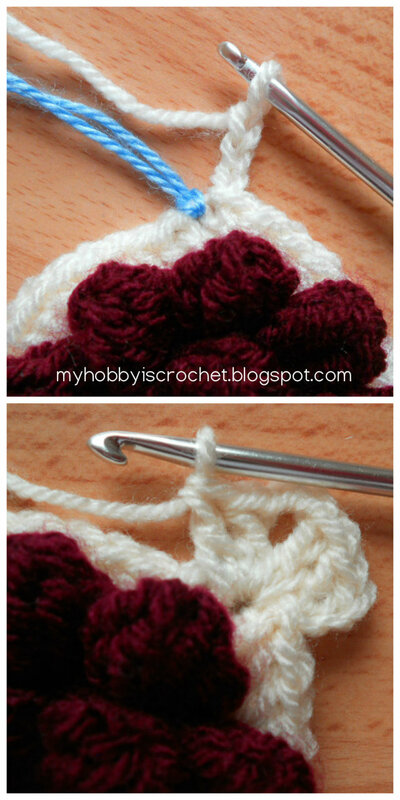 stitch on the right side, beginning with the first dc after the beginning ch3. 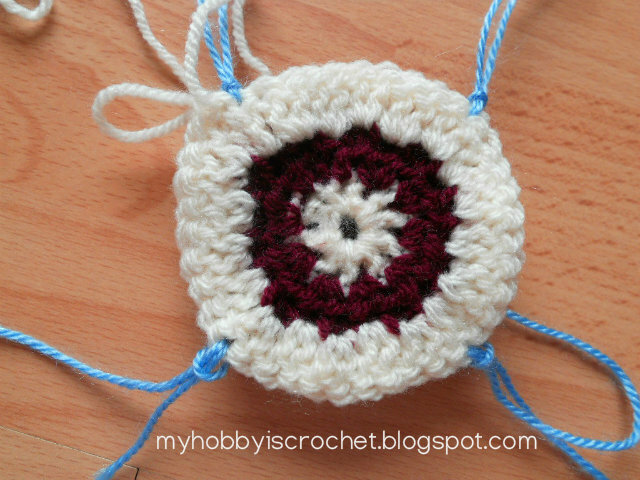 Work the first side of the square (9 stitches) in this order: 1dc, 2 hdc, 3sc, 2 hdc, 1dc. Join with slst in the top of the beginning ch3. 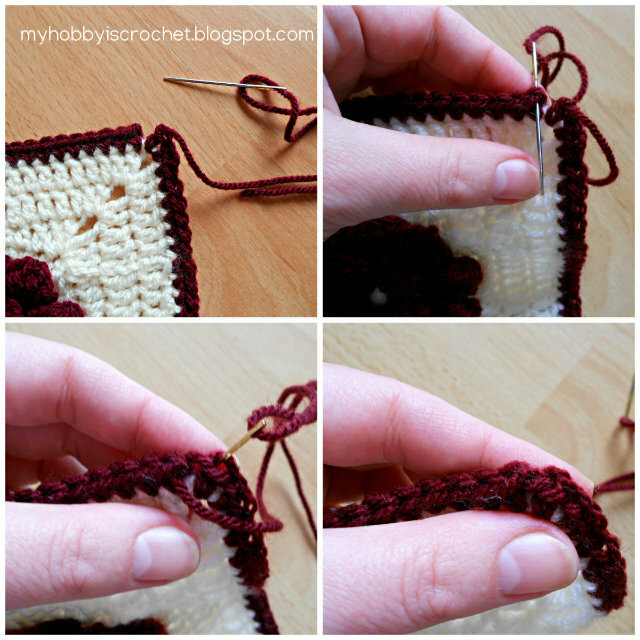 Slip stitch made; second round complete. Round 3: Begin with ch3 (count as a dc), work 1dc in each stitch across the sides and (2dc, 2ch, 2dc) in each corner= ch2 spaces of the previous round. On each side you'll have 13 dc (4 stitches more as in the previous round). Join with a slst in the top of the beginning ch3. 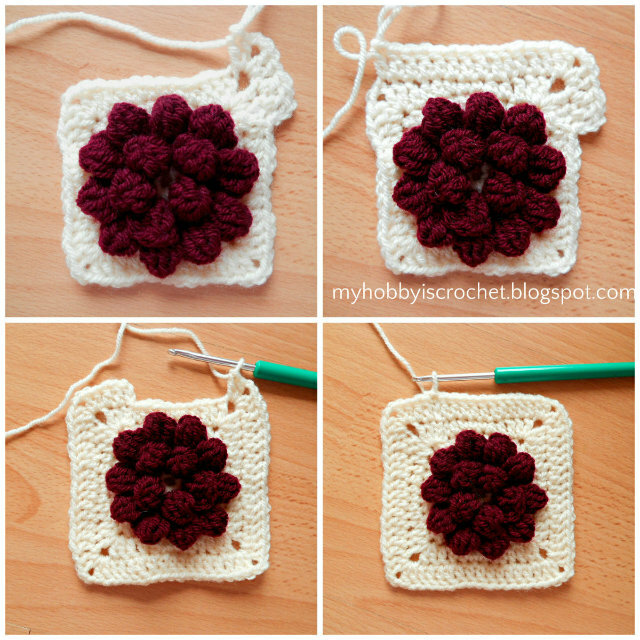 Round 3 of the granny square. Round 4: work the same way as for round 4. Each side will have 17 dc. Fasten off invisibly like in the collage bellow. Completing round 4. Invisible finish off. 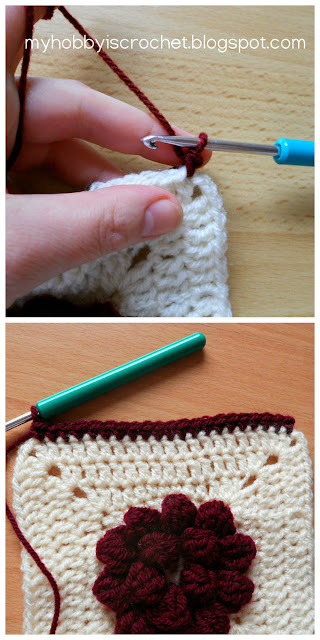 Border: with a contrasting color yarn (the one you used for the flower, or in another color- your choice) begin with a standing single crochet in a dc of the previous round, than work 1sc along each side, for a total of 21 sc on each side and (1sc, 2ch, 1sc) in each corner. Fasten off invisibly like in the picture below. Completed border. Invisible finish off. Another color option for the square, with rounded border edges: make in each corner 3sc instead of 1sc, 2ch, 1sc. 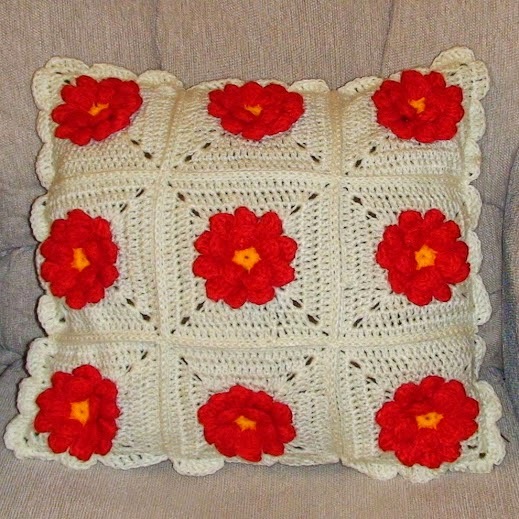 Here is a beautiful Dahlia Square Pillow made by Oana from Crochet by Oana using this pattern! I love it! 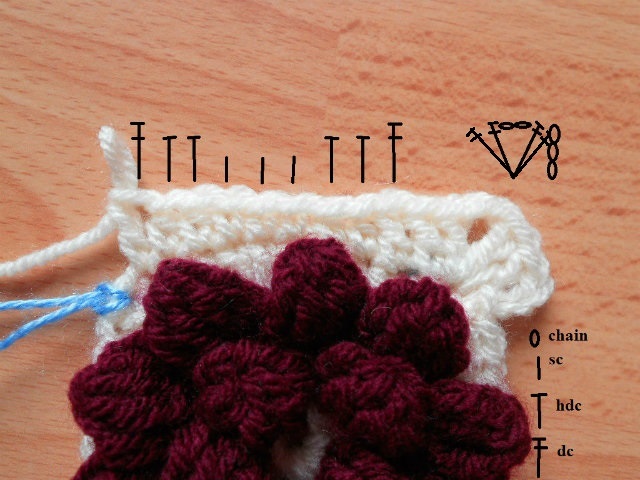 What projects would you make using this pattern? 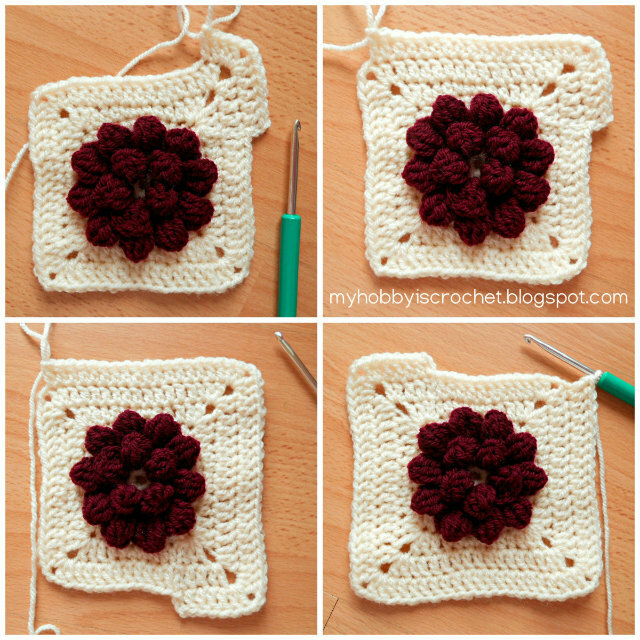 If you enjoyed this pattern, please visit my other free crochet patterns and tutorials! 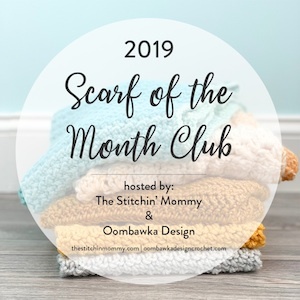 I would love to see your projects made using my patterns! 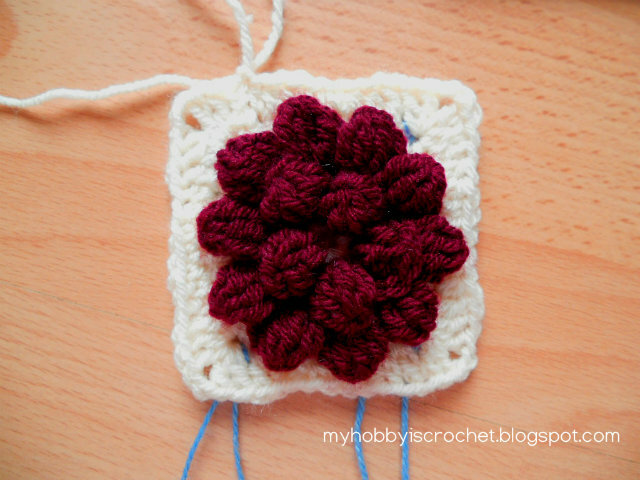 Please share your pictures on my Facebook Page Myhobbyiscrochet!